Ladies only! Special evening event! An evening just for the ladies includes Pampered Chef demos, Angel Card readings, and an Origami class. And of course, trolley rides. 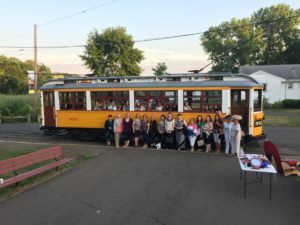 So grab your girlfriends and come down for a night of fun at the Trolley Museum. Join us for a social hour with complimentary appetizers and wine at our Sprague Station building. Then climb aboard one of our beautifully restored antique trolley cars for a sunset ride through the peaceful tidal marsh in Branford. On the return trip, we will tour some of the Museum’s unique collection of historic trolleys. Tickets are limited for this event, cost $10 each and may be purchased at the door or ONLINE BY CLICKING HERE. Please remember to dress appropriately for the predicted weather.